Once you have fully cleared all of the previous 4 puzzle types, you will get to face off against Dr. Boom and a very difficult set of puzzles from each category. After completing all of Dr. Boom's Puzzles, you will be awarded a card back. Hints and Solutions for each Dr. Boom's Puzzles can be found below. Use Super Soldier to ensure all of your minions have charge. Maximise the damage of your Whirlwind effects and minion trade to get the biggest Frothing Berserker possible. Trade both Dread Corsairs into the Sludge Belcher. Trade a Grim Patron in to the Slime from the Sludge Belcher. Cast Slam on a 3-Health Grim Patron. Attack the enemy Hero with the remaining 5 Grim Patrons, your Frothing Berserker, and your weapon. Keep track of which side of the board the Spud M.E. will be on after each point of damage. Make sure your Wild Pyromancer does not die. Take care when calculating Defile damage. Play Power Word: Tentacles on the Wild Pyromancer. Play Divine Spirit on the Wild Pyromancer. 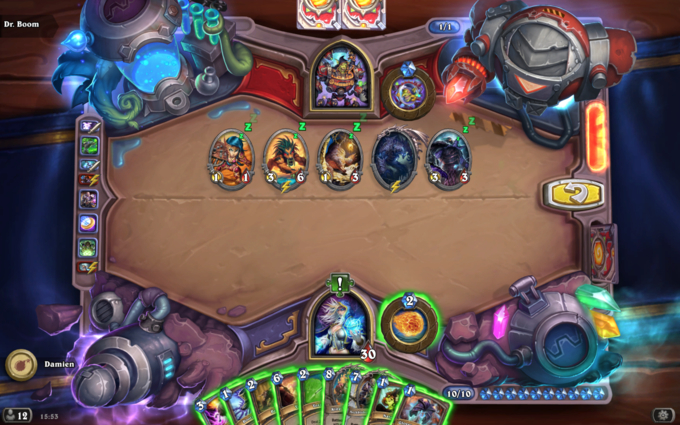 Use Holy Smite on the Spud M.E..
Be careful when drawing cards with your Northshire Cleric as you begin at 1 Health. Try to maximise the number of damaged minions on the board and the number of Northshire Clerics on your opponent's board. Play Power Word: Shield on either Northshire Cleric. Use Lab Recruiter on Northshire Cleric. 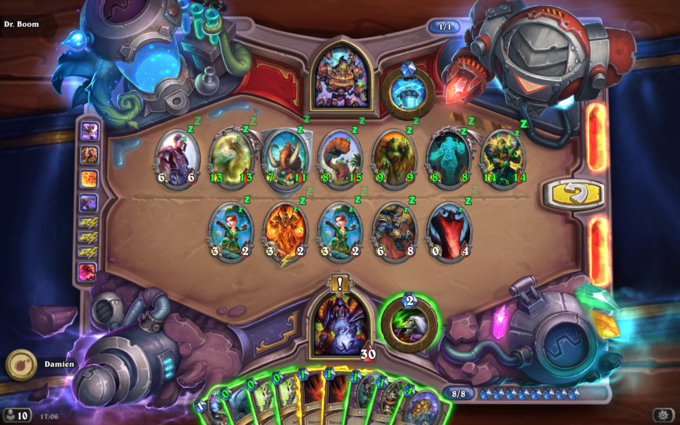 Play the Wild Pyromancer that was drawn. Use Elven Archer on your Lab Recruiter. Play all of your Northshire Clerics. Play Binding Heal on any undamaged minion to trigger Wild Pyromancer. Use Treachery on your remaining Northshire Cleric. This puzzle is very similar to the previous one, but Undercover Reporter will guarantee shuffled minions go to the top of your deck, unlike Lab Recruiter. 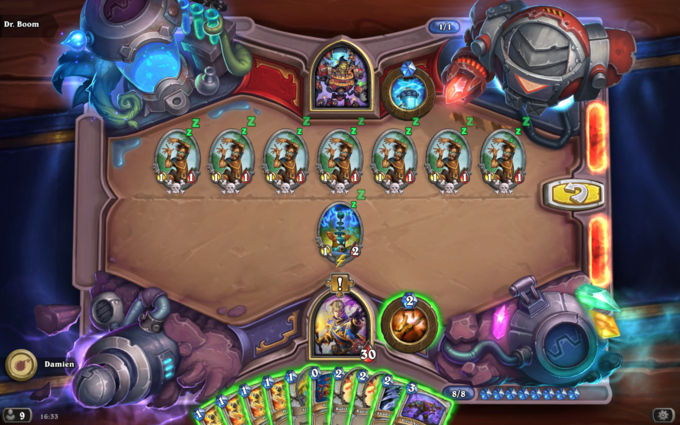 Ensure you maximise the number of damaged minions on the board as well as the number of Northshire Clerics your opponent has. Use Undercover Reporter on your Northshire Cleric. Use Elven Archer on your Northshire Cleric. Use Power Word: Shield on your Elven Archer. Play your freshly drawn Northshire Cleric. Heal your Northshire Cleric with your Hero Power. Play the final Northshire Cleric. Play Treachery on your remaining Northshire Cleric. Use Binding Heal on Undercover Reporter. The remaining card in your deck is Silence. Prince Taldaram can be used to copy minions of either player. Copy Abomination with Prince Taldaram. Trade your Abomination into your opponent's Abomination. Trade your Cruel Dinomancer into one of your opponent's Sea Giants. Use Kidnapper on a second Sea Giant. Use your Kidnapper to trade into your opponent's final Sea Giant. Your opponent's Secrets that are in place are Mirror Entity and Freezing Trap. Healing Wave will only heal for 7 if there are no minions in your deck. 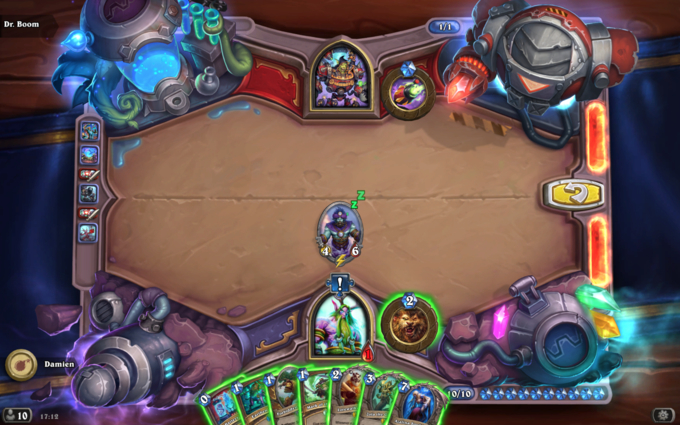 As there are no card duplicates on both boards at the start of the puzzle, a nearly full board clear is required. Use Recycle on an Ultrasaur. Attack any minion with Archbishop Benedictus to trigger Freezing Trap. Trade your Polluted Hoarder and Radiant Elemental into your opponent's Hoarding Dragon. Play the 2 copies of The Coin in your hand. Trade Ice Rager into your opponent's Loot Hoarder. Use Healing Wave on your opponent's second Ultrasaur. Trade your Auchenai Soulpriest into your opponent's Reckless Rocketeer. 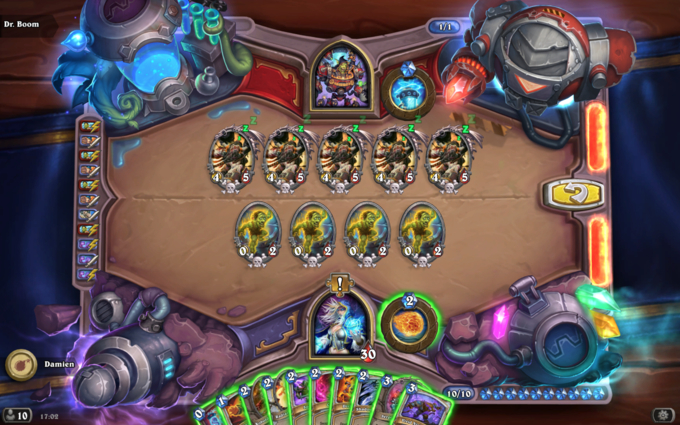 A dormant copy of The Darkness cannot be removed with Vanish. Although you have no card draw and have cards in your deck, this can be circumvented with King Togwaggle, Naturalize, and Gloves of Mugging. 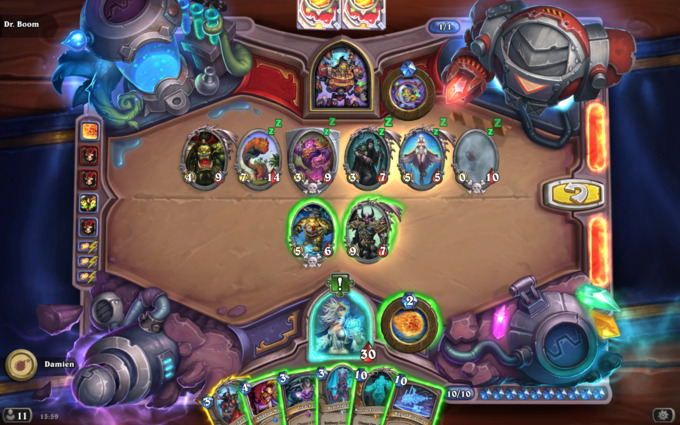 All cards can be played for free with Archmage's Insight and Boots of Haste. Your opponent has two copies of Magma Rager in their hand. 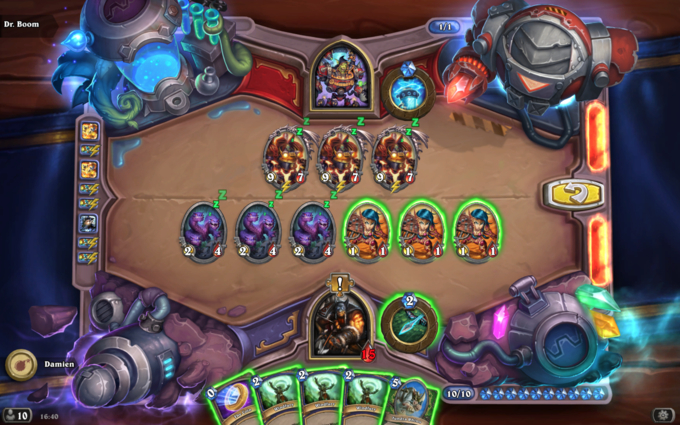 Your start with 3 copies of Darkness Candle in your deck. You need to find a way to draw them. Use your Hero Power on your opponent's Howlfiend. Use Toxic Arrow on your opponent's Dire Mole. Use Betrayal on your opponent's Dire Mole. Play Novice Engineer to draw the Darkness Candles from your deck. Use Faceless Manipulator on The Darkness. Use Naturalize on your Novice Engineer. 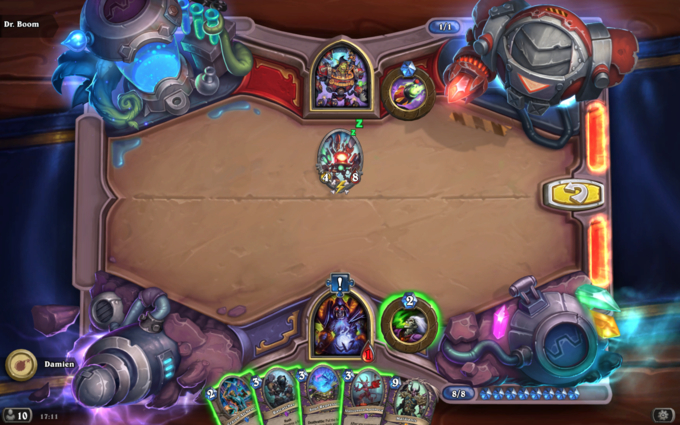 The Deathrattle of Boom-in-a-box triggers immediately upon death, regardless of subsequent damage. There are many great targets for Prince Taldaram and Shadow Madness available, such as Aviana and Glinda Crowskin. 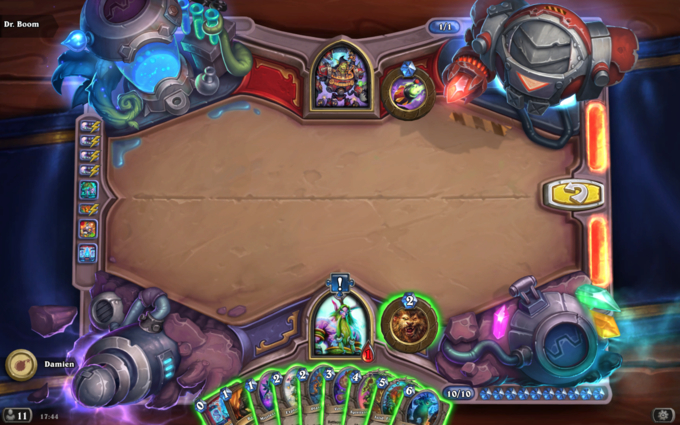 Be careful making minions immune with Deathspeaker as it will prevent them from ever being killed to mirror the board. Steal Glinda Crowskin with Shadow Madness. Use Prince Taldaram to copy Aviana. 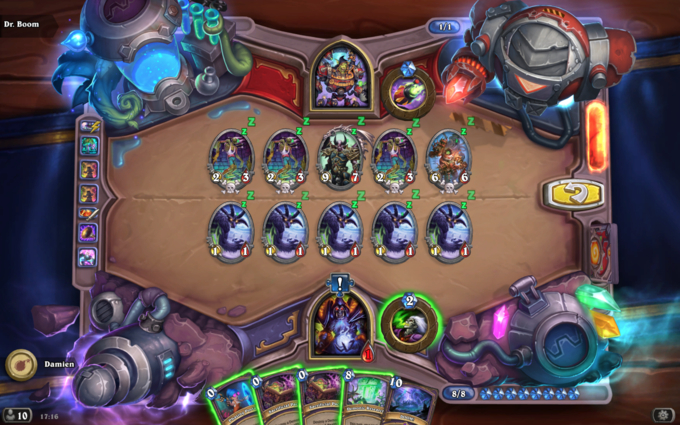 Use your Prince Taldaram echoes to create two more copies of Mal'Ganis so that your original copy exceeds 10 Health. Use Kun the Forgotten King to refresh your Mana Crystals. Test Subject can be used with Topsy Turvy to generate extra spells. 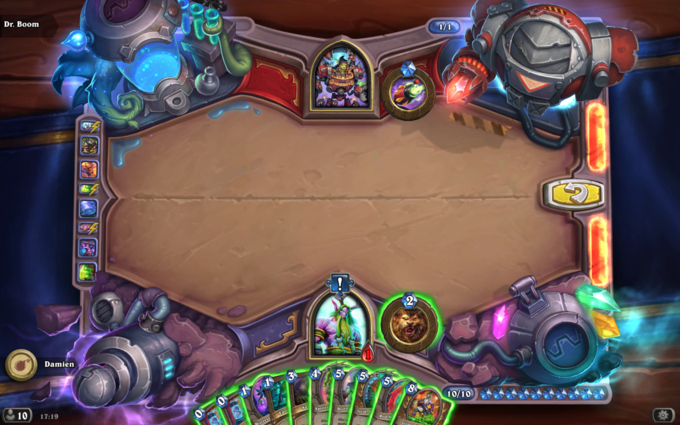 It is not possible to infinitely create spells with the cards available and just 8 Mana. A second Gelbin's Coil will double the efficiency of your spells. Play both copies of Radiant Elemental. Use Vivid Nightmare on your Test Subject. Use Topsy Turvy on one of your Test Subjects. Use Vivid Nightmare on your Gelbin's Coil. Use Topsy Turvy on your remaining Test Subject. Use Shadow Word: Pain on one of your Radiant Elementals. Use Topsy Turvy on your other Radiant Elemental. Use Holy Smite on an enemy minion. Use Holy Smite to kill one of your Gelbin's Coils. Use Holy Smite to kill your Radiant Elemental. Use Holy Smite to kill your final Gelbin's Coil. Using Cave Hydras on Leper Gnomes is a great way to damage the Mekgineer Thermapluggs. You have a finite amount of Health so try to limit the number of Leper Gnomes that you spawn. Attack the middle Mekgineer Thermaplugg with one of your Cave Hydras. Use Windfury on your remaining two Cave Hydras. Use one attack with each of your Cave Hydras to attack the two left-most Leper Gnomes. Use the second attack of a Cave Hydra to kill the centre Mekgineer Thermaplugg. Use your other Cave Hydra to kill the left-most Mekgineer Thermaplugg. Use your Tundra Rhino to kill the remaining Mekgineer Thermaplugg. 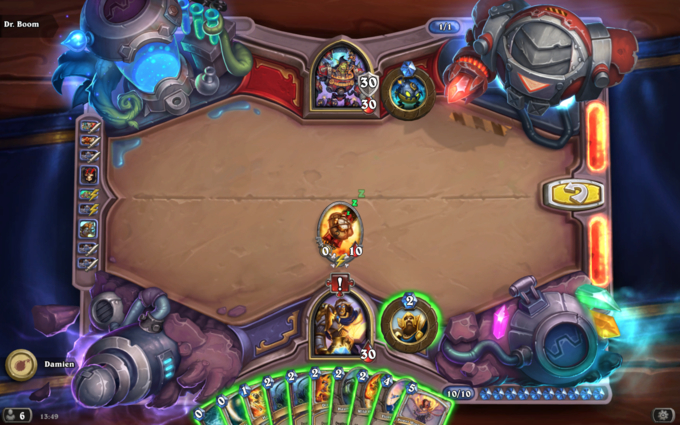 Use your 3 Novice Engineers to kill the remaining 3 Leper Gnomes on the board. You have many Test Subjects available but very little space in our hand to duplicate combo pieces. Sergeant Sally is a great AoE tool if you can buff her enough. Cast Divine Spirit and Vivid Nightmare on a single Test Subject. Use Shadow Word: Pain on the copied Test Subject. Use Shadow Word Pain on the original buffed Test Subject. Cast 2 copies of Divine Spirit on Sergeant Sally. Use Vivid Nightmare on Sergeant Sally. Use your Fireblast Hero Power to kill off a copy of Sergeant Sally. 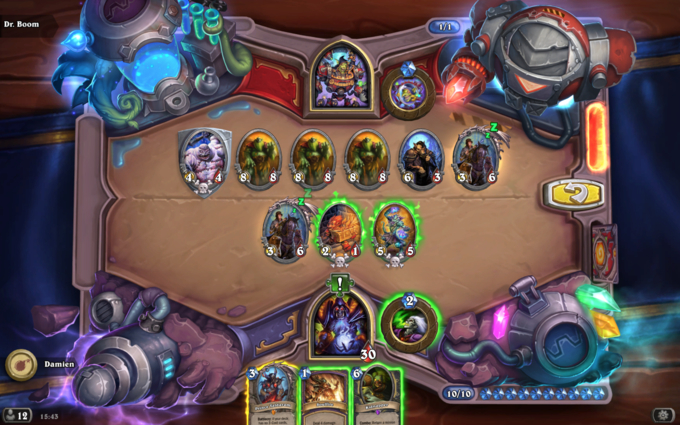 The board is very powerful, but there are a large number of different Health values for Defile plays. Try to nullify your Wild Pyromancer so that you can play spells freely. 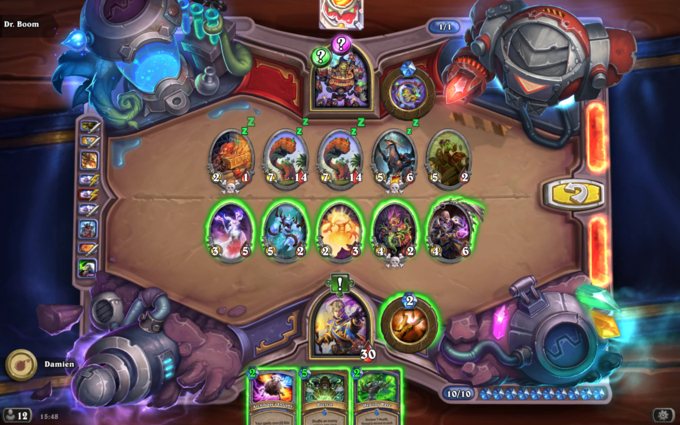 Use Void Terror and Ratcatcher to reach some of the higher Health totals for the Defile chain. Cast Demonfire on the enemy Ultrasaur. Place your Moat Lurker on the far left side of the board and target your Wild Pyromancer. Play Arcane Anomaly away from the Moat Lurker. Use your Ratcatcher on your Fearsome Doomguard. Use your second Demonfire on the enemy Jade Golem. Use Bloodfury Potion on any non-Demon minion. Place your Void Terror on the left-hand side of the board so that it only devours the Moat Lurker. Unlicensed Apothecary will not do any damage if it is immediately killed by a minion's Battlecry. Try to find a way to make Mal'Ganis the lowest Cost minion in your hand to utilise Soul Repressor. Use Ratcatcher on your Unlicensed Apothecary. Use Crazed Alchemist on your Soul Repressor. Unlike other Puzzles, your opponent will deal exactly 40 damage to you this time so you will need to gain enough Armor to get out of range. 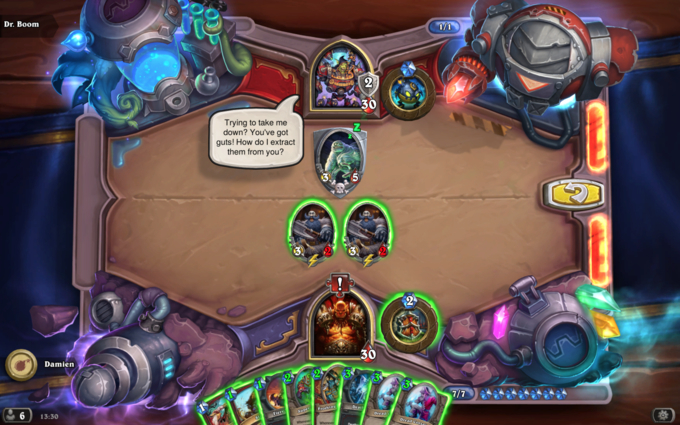 The combination of Azalina Soulthief and Lorewalker Cho can be used to get additional copies of cards via your opponent. Use Zola the Gorgon on your Lorewalker Cho. Play a second copy of Lorewalker Cho. Play Mark of the Lotus. Play Earthen Scales on your Forbidden Ancient. Play another copy of Mark of the Lotus. Play a second Battery Pack. Use two copies of Earthen Scales on your Forbidden Ancient. This is another puzzle where the enemy will do 40 damage to your at the end of your turn, regardless of your maximum Health. The remaining cards in your deck are 4 copies of Steel Rager. Rusty Horn can be used to access targets protected by Taunt minions. Use Zilliax's Magnetic buff on your Recruited Steel Rager. Use Rusty Horn on your opponent's Turret Sentinel. Remove the Turret Sentinel with your Steel Rager. Play 2 copies of Branching Paths, picking +6 Armor for every choice. Use Earthen Scales on your Steel Rager. 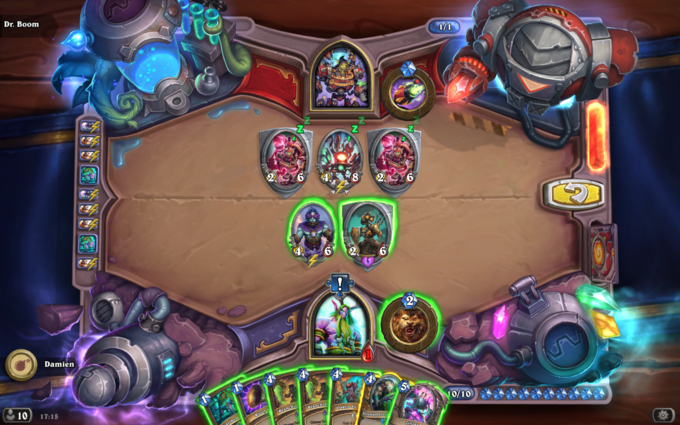 Mal'Ganis is an easy way to avoid damage. Find a way to be able to play it. Soul Repressor is a great way to summon Demons without paying their Cost. Although it may seems really tempting, playing Kobold Librarian is not essential for the solution. Cast two copies of Sacrificial Pact on your 1/1 Imps. Use the Carnivorous Cube on the Soul Repressor. Cast Dark Pact on the Voidlord summoned by your Soul Repressor. Cast another copy of DOOM!. Play Flame Imp on either edge of the board. Play Void Terror in between both Soul Repressors to ensure you pull Mal'Ganis from your hand. Maximise the number of Djinni of Zephyrs you have to get extra value from your Earthen Scales. Red Mana Wyrm is a great primary target for Earthen Scales. Manage your board space carefully when using Ixlid, Fungal Lord. Play your Djinni of Zephyrs. Play your second Battery Pack. Place Gloop Sprayer between your two Djinnis. Use Earthen Scales on your Red Mana Wyrm. 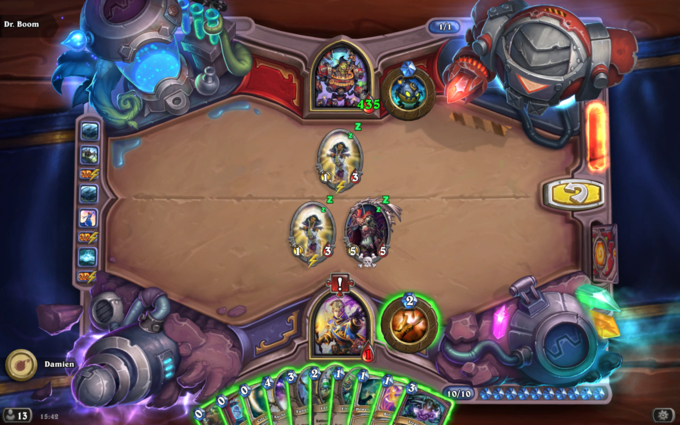 Plan ahead and make sure you have a way to remove minions from your board. Utilise the massive healing that comes from Spiritsinger Umbra and certain Deathrattle minions. Every Mana counts! Be careful not to waste any. Use Barkskin on Ixlid, Fungal Lord. Use Voodoo Doll on your Explosive Sheep.